I will discuss recent results on the environmental context - astrophysical and planetary, that makes possible the synthesis of precursor molecules to RNA, peptides, and lipids. My focus will be on the role of stellar mid-range UV light from about 200 to 300 nm as a source of energy and as a very specific selection agent in chemical evolution. Very interesting stuff, as UV and its levels are pivotal to the development of life in the cosmos at large. I was always interested as to what the absolute stellar UV limit is to prevent even very exotic life (like silicones polymers) from developing. Yes, and a subject that has been a foci of misunderstanding for a long time. Too many times have people ridiculed the so-called 'holographic universe' theory based off of the name alone. Only when they actually study it and attend to presentations made by erudite individuals who actually know what they are talking about, do they realize it holds water within established physics (well, okay maybe string theory is a bit far out ). Ah, Susskind is always worth a watch anyways . I really like Susskind's presentation style, both in lecture and in his books. Also, (and more on the theoretical side), you might enjoy hearing his ideas on the ER=EPR conjecture, if you aren't familiar with it already! Source of the post you might enjoy hearing his ideas on the ER=EPR conjecture, if you aren't familiar with it already! I was not aware of that, but thanks for the heads up! I'll check it out. My black hole home doesn't have a neighbor. It's sad really... I could use the company. DoctorOfSpace, while we are at black hole mergers, scientists have observed a handful of stellar mass (more or less) black hole gravitational waves events. How often, statistically speaking, do binary supermassive black holes merge in the observable universe? I assume such events to be associated with galaxy collisions only. What are the chances of detecting gravitational waves from a supermassive BH merger within a lifetime? Source of the postWhat are the chances of detecting gravitational waves from a supermassive BH merger within a lifetime? Quite good, actually! The expectation is that LISA will be able to detect a few 10s or 100s of massive black hole coalescence events per year. Massive black hole binaries result from galaxy mergers, as the central black holes find each other and spiral together pretty rapidly (within about 100 million years). It has been a problem though to understand how, once they get to about 1 parsec apart, they manage to continue to spiral together to merging. At distances much greater than 1 parsec the inspiral works efficiently by scattering stars, yet gravitational wave emission doesn't become too strong until scales much less than 1 parsec. 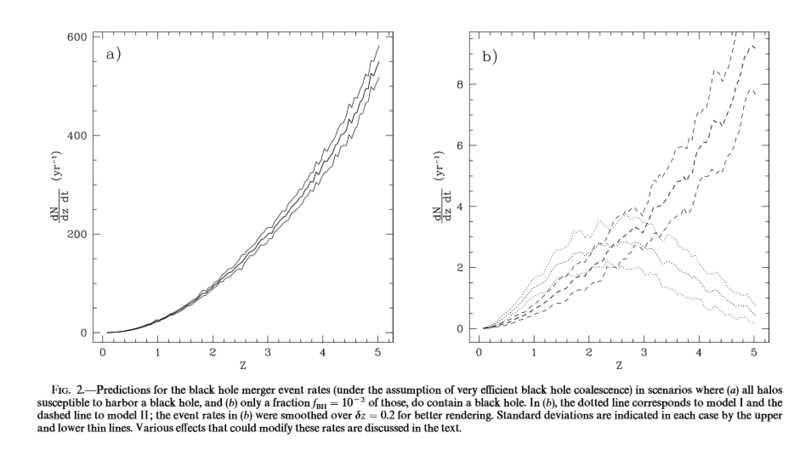 So for a while astronomers did not understand why we do not see large numbers of black hole binaries "hung up" with ~1parsec separations -- the "final parsec problem". Lately this problem has been pretty much resolved, and it turns out there are actually several mechanisms that allow the inspiral to proceed all the way to coalescence. Not only is that good for our understanding of mergers, it also means we are very likely to see the process in gravitational waves. The entire population of massive black hole binaries in the universe produces a stochastic background of gravitational wave noise, which should be detectable in Pulsar Timing Arrays. At least one of these systems should be nearby and massive enough to resolve individually above that background noise, as well. What is the actual coalescence rate across the universe? Estimates vary by author and model, but optimistically it may hundreds per year out to a redshift z=5, and pessimistically still about 10. To interpret this figure, think of it as showing the number of events you expect to see per year, if you look out to a distance where the redshift is z, but happening within 1 unit of z of that distance. So for example if you want to know how many total merger events there are per year within z=5, then you would add up the number in each z=1 interval out to z=5, which for the left figure is nearly 1000, and for the right image is 9 (model I) or 15 (model II). For perspective, the comoving distance to a redshift of z=1 is about 3.3Gpc, and the comoving volume within that distance is 150 Gpc3. For a redshift of z=5, the comoving distance is 7.8Gpc, and comoving volume is 2000Gpc3. So we could infer that the rate in the universe today is something in the realm of 0.01 to 0.1 mergers per year per Gpc3. Watsisname, thank you. I did not realize that galaxies collide all the time. I was surprised by these numbers as well. I did not expect that there would even be one detectable massive black hole merger event per decade, let alone many per year. But I guess it's not really that the rate is high -- 1Gpc3 is a huge volume of space containing a lot of galaxies -- but that the waves from such a merger are very strong and detectable out to very large distances. This also reminds me of the math behind the development of life being common or not in the universe. The universe is very big, so even rare events must happen all the time. The first episode of John Michael Godier's Event Horizon podcast, a new channel comprised of interviews Godier does with eminent scientists of astronomy and astrophysics. This one was a interesting topic with an interesting interviewee. The main reason I posted this is because Godier uses Space Engine footage at various parts in the video. Note how almost every mystery may equate aliens . LEMMiNO's latest video. I think the forum members will know the source of most of the video's space/exoplanet content . I hope LEMMiNO will make a feature-length documentary (on any subject, really). His presentation style and production-quality is very good and allows even the unaffiliated to easily understand and follow the information being presented, something sadly lacking in many modern YouTube 'documentaries'. That being said, is total videos rival many documentaries in content and time, and are well worth a watch. The above video is a great introduction to the Fermi 'Paradox' and SETI activities - with surprisingly few of the scientific inaccuracies that have become characteristic of this video type.